On the corner of Pensacola and Grayton, the cottage is three streets west of the Seaside town center and a short block from the beach. Serendipity was featured in Travel and Leisure. The open architecture and beach palette invite you to relax. There are two porches, a third floor wrap around deck, perfect for outdoor dining, and a fourth floor catwalk, which offers stunning views of the ocean and the beautiful town of Seaside. A second floor window seat offers the option of sleeping six comfortably. The cottage is equipped with Wi-Fi, cable TV, and free long distance calling. It has brand new luxury mattresses, a juicer, board games for the whole family, and books to entice almost any reader. The nature and bike trails in Seaside, Watercolor, and Grayton give you access to the natural beauty of Florida's wetlands and seashore. The town center and 30 A, have restaurants, shopping and galleries that will all help to make your vacation unforgettable. *There is not a grill at this property. We have had a blast! This adorable cottage is perfect for our family of six. It is ideally located for all the amenities as well. We loved watching beautiful sunsets and shooting stars from the deck. 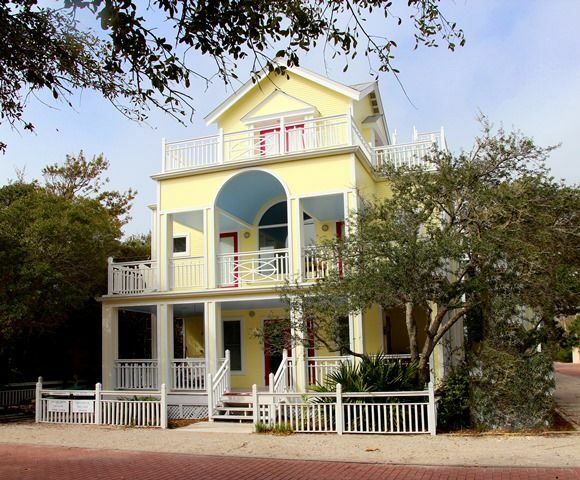 Our family of 6 (with 4 kids ages 10-24) loved our 1st vacay in Seaside at the Serendipity house! So ez on my budget that we were able to afford beach chair rentals, bikes and ice cream every night. A few (very minor) improvements could make it better, but they wouldn't stop us from going back. The window seat was so big that our 10 year old slept there all week (but we'll bring a set of twin sheets next time). My husband and kids fussed the first day about no tv in the bedrooms (of course, I knew about this when I booked), but this mama loved it bc it got everyone in one room! A couple of full length mirrors would've helped out with 3 girls but guess what? We survived! If I could make one change it would be to add a couple of small bedside tables with some hotel style reading lamps (the ones with outlets at the base) in the master. There wasn't a grill, so darn, we had to go to town (literally 2 min walk) to eat at Great Southern again! The 2 swings on the front porch were my favorite part and a corner lot was a bonus. The house is the perfect location between the beach, town and the West end family pool! Outstanding property in the perfect location to walk to the beach or town center. Great area for a romantic get-a-way, morning jogs and a family vacation. What's better than a porch? 4 stories of porch! Serendipity is a whimsical little charmer in a most excellent location. 5 minutes to the beach and 5 minutes to Seaside's town center. I love porches and this house has 4 stories of them, including the highest one accessible by a ship's ladder from the third floor wrap porch. That ladder is however, very steep and would be dicey for little ones, but the view of the ocean and Seaside rooftops is spectacular. First floor contains a small kitchen, open living area, dining area that seats six, and a powder room. Second floor has two bedrooms opposite each other across an open space both with fun shutters that open so you can see into the area below. Don't worry, there are railings for protection. It's like New Orleans in the house, super fun--but we did not need privacy either since we are just one small family. The hallway between the two bedrooms contains a twin window seat/bed which my kid loved and slept in over one of the bedrooms. Then there is a bathroom with a separated sink, and another small adjacent room with a toilet, the washer/dryer, and a small shower. There is a funky cool porch accessible from both bedrooms on this level through east facing glass doors. Third floor has a cute little sitting area next to a full bathroom (the only one in the house) and then you step up into an open bedroom that has French doors on three sides. This room has an awesome view of Seaside rooftops right from the bed! There is a wrap porch outside each French door with some chairs, a bench, and a small table. You can see the ocean. Ship's ladder is outside the north set of doors to the small rooftop porch. The bathroom up here has a hair dryer in the vanity if you don't want to pack yours. Pros: The front door has a lockbox so you don't have to carry a key, we loved that. Location close to everything. We loved the porches, especially the front porch swings. Views, lots of cool ones right from the house. The house is unique design wise and quintessentially Seaside with its fun details and colors. There is an outdoor shower on the side of the front porch (south side), helpful when coming from beach. The beds are comfortable. Excellent price compared to other rentals we looked at. Cons: The decor is a bit dated and the house has some wear. Wish bedroom had reading lamps, the recessed can lights blaze in your face. Stains on twin bedroom duvet covers (others were very clean though). TV setup is confusing and none in bedrooms. Beautiful house! Very clean, perfect layout for our family of 6! The location is excellent, only 1 block away from the best pool in Seaside and an easy walk to the beach or the center of town. We didn't have any problems getting the TV to work. We typically wouldn't watch TV during vacation, but we were there during the Olympics this past summer and were happy to be able to watch every night. The porches were lovely, we really enjoyed the two porch swings on the first floor. Most porches in Seaside seemed to be screened, but we didn't have a problem at all with bugs and preferred the more open porches of Serendipity. Our kids are already talking about going back next summer and we definitely want to stay in this cottage again! Two of the three bedrooms have shutters that open into the main room--which allows for little privacy/noise control. If someone was up in the kitchen- you could hear them from both bedrooms. House was in great location but definitely sparsely furnished. We may have a different aesthetic than this renter. If you look carefully at our cottage pictures, you will find that the cottage is very comfortably and amply furnished, with a minimum of clutter. Two bedrooms have recessed ceiling lights positioned over the beds for easy reading, and the tower bedroom has a reading alcove with two club chairs for reading. We have an iPod dock for music, and there is a detailed laminated TV instruction guide in the cottage. Lamp cords would be a hazard in our open cottage design, and many guests find the louvered openings to the second floor bedrooms a lot of fun. A full length mirror is a good idea, and we will add one to the back of a door.